Hip, hip, Harrah! 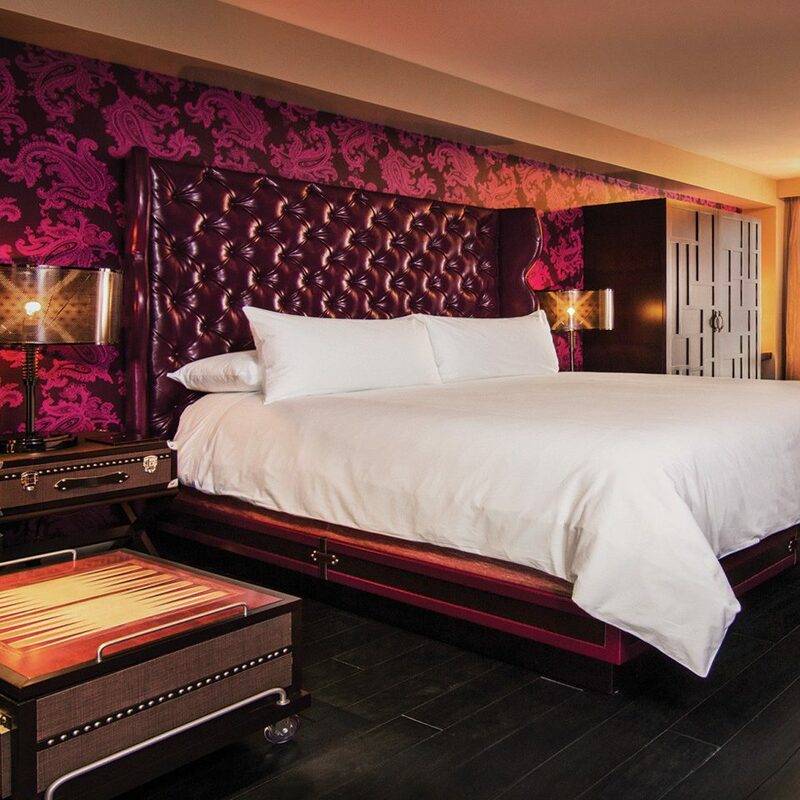 This hotel on the Strip has everything you want from your Sin City stay, and then some. 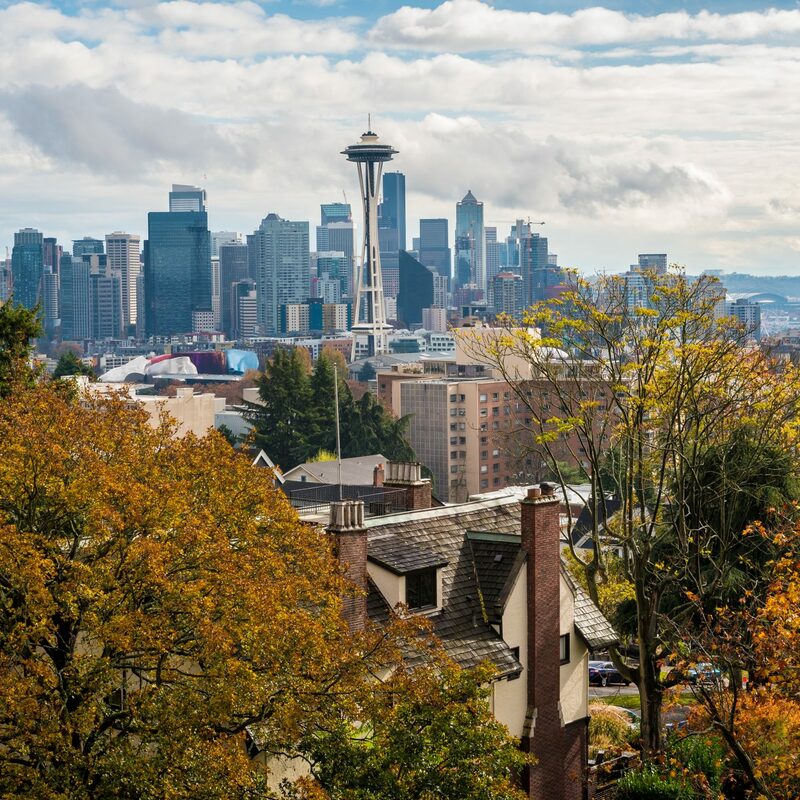 Enjoy locations of some of your favorite chain restaurants, like Ruth’s Chris Steakhouse and Ben & Jerry’s, soak up some sun by the pool, let your hair down at an open-air street party or decompress at the soothing wellness center on the fourth floor. Picking out a whole new wardrobe is easy, thanks to the 12 shops (plus a UPS store, for shipping it all home), and quite a few entertainers take the stage each evening, like soul band The Righteous Brothers and comedian and magician Mac King. 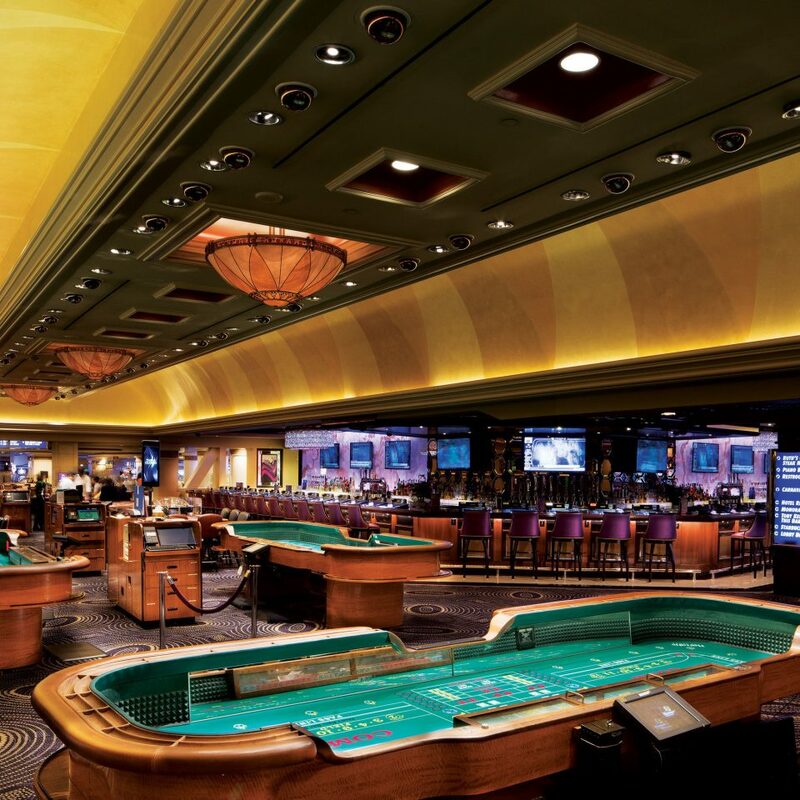 If you’re ready to roll – the dice, that is – the casino boasts more than 80 table games, plus slot machines that can win you the Vegas jackpot. 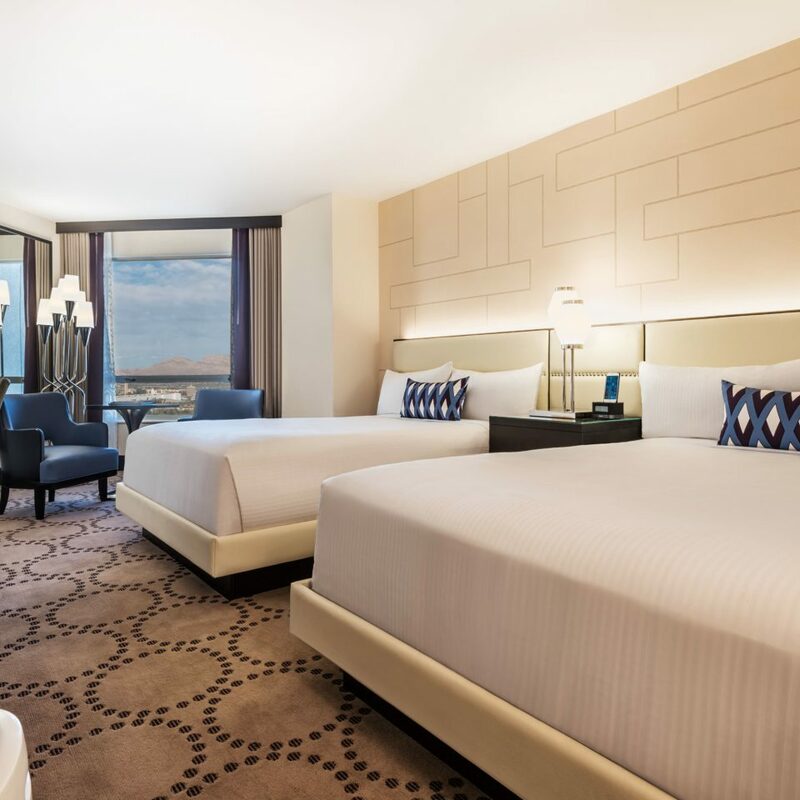 And whenever you start itching to explore beyond the Harrah’s Las Vegas grounds, the Strip’s greatest hits are at your fingertips. The High Roller – the world’s tallest observation wheel – is right next door, as is the surrounding promenade at The LINQ. 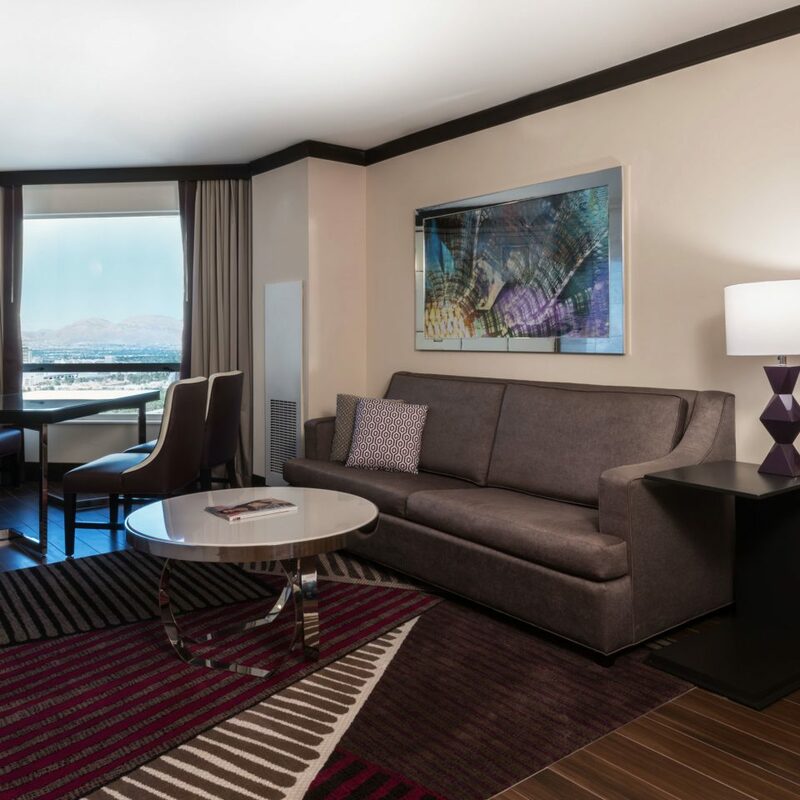 Speaking of The LINQ, it shares a monorail station with you, making shuttling up and down the famous boulevard, as well as rubbing shoulders with the glitterati at Drai’s at The Cromwell or taking in a show at Planet Hollywood, a breeze. Talk about hitting the Vegas jackpot. 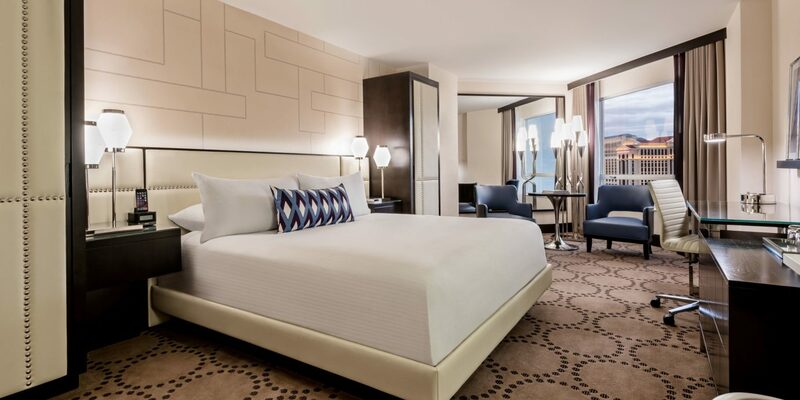 The brand-new Valley Tower rooms are elegantly designed, with chic, creamy tones and high-end furnishings. 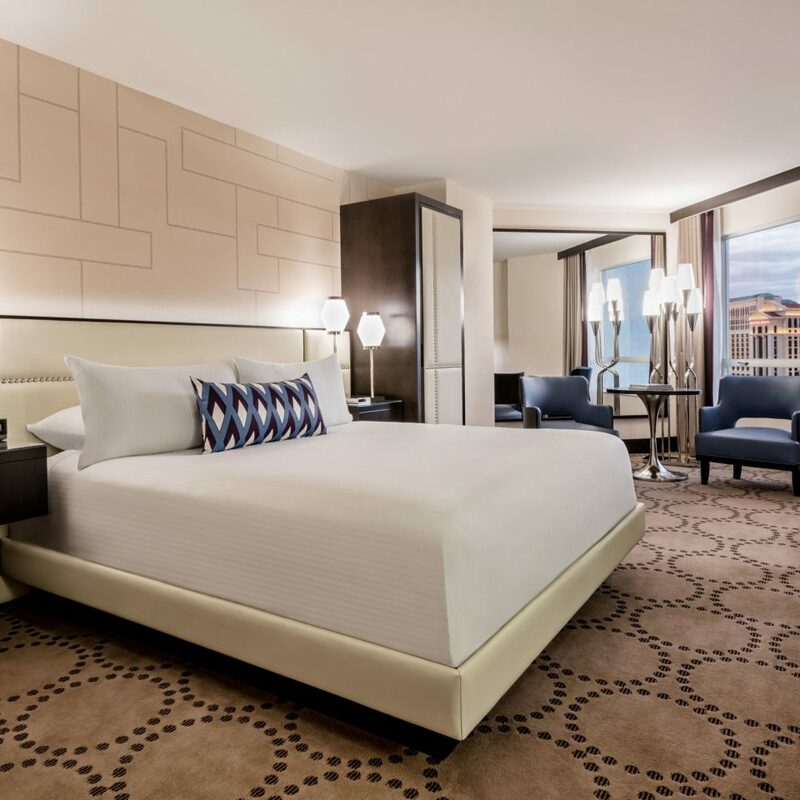 You’ll enjoy 300 square feet of space, impressive views of the Strip and a choice between one king-sized or two queen beds. 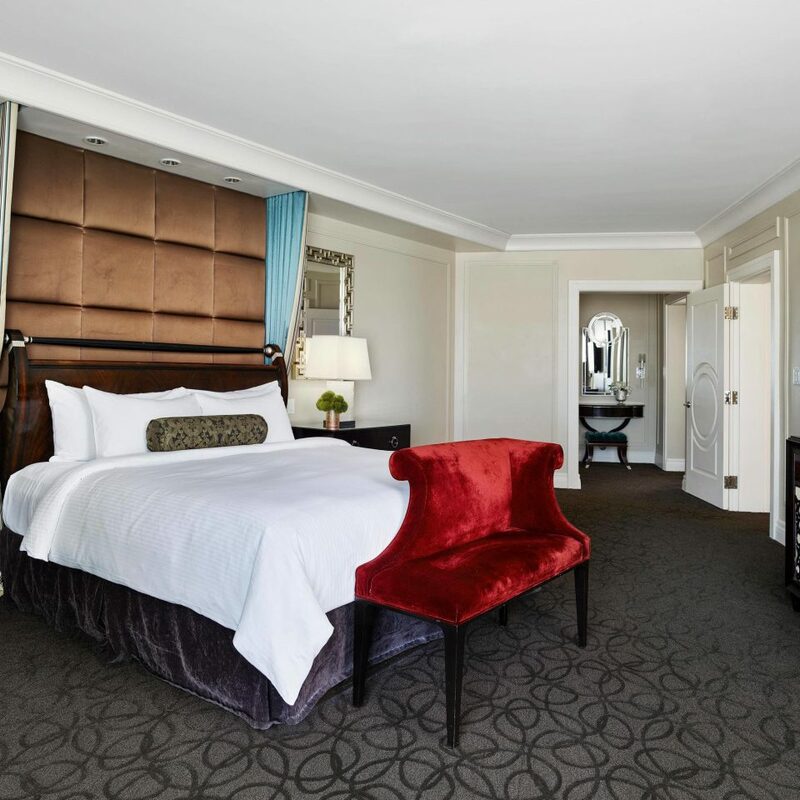 For a more luxurious stay, opt for the Valley Tower Executive suite, boasting a roomy 600 square feet, a separate bedroom and a bar. 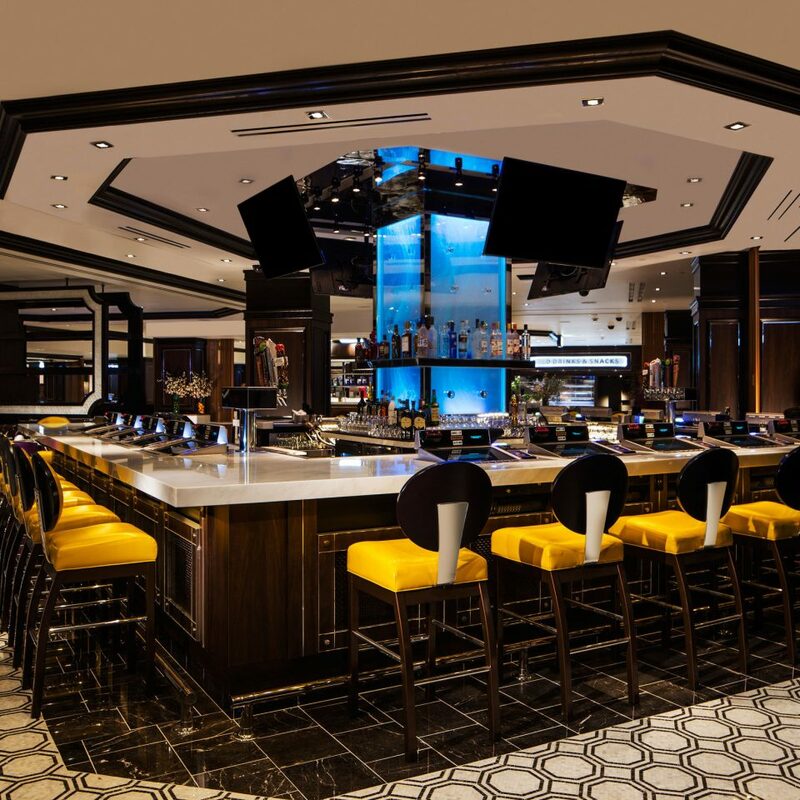 You get six choices in the dining department, including an oyster bar, a buffet, a food hall, a Ruth’s Chris steakhouse, a grill by country star Toby Keith and a newly opened Ben & Jerry’s. 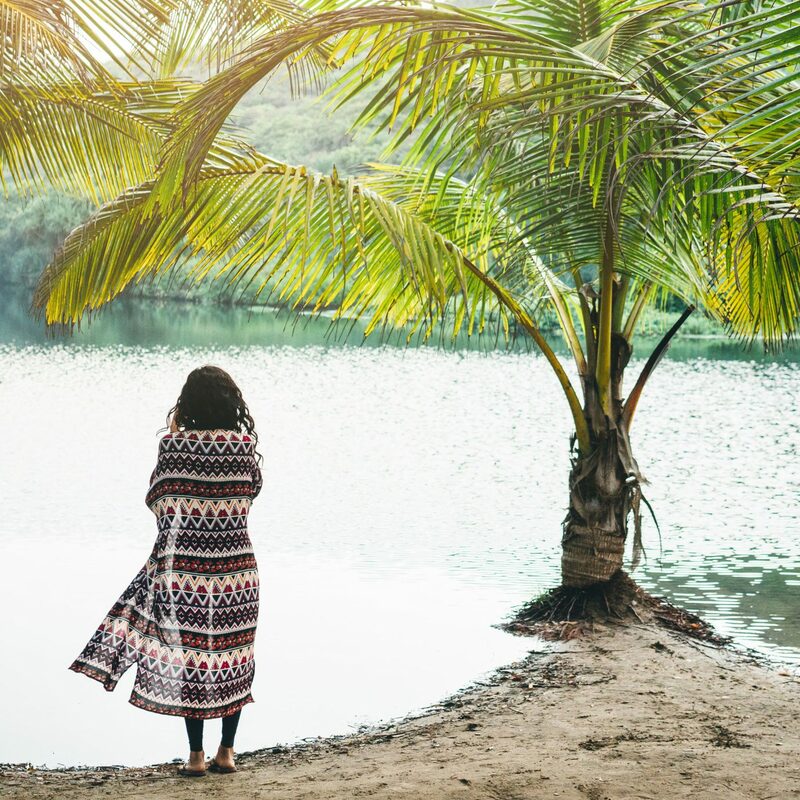 You can’t go wrong with any of the four drinking options, either: Signature Bar; Numb Bar, which focuses on frozen drinks; and the Piano Bar are sleek and cosmopolitan destinations, while Carnaval Court has a more raucous vibe, thanks to the open-air dance parties that it hosts. 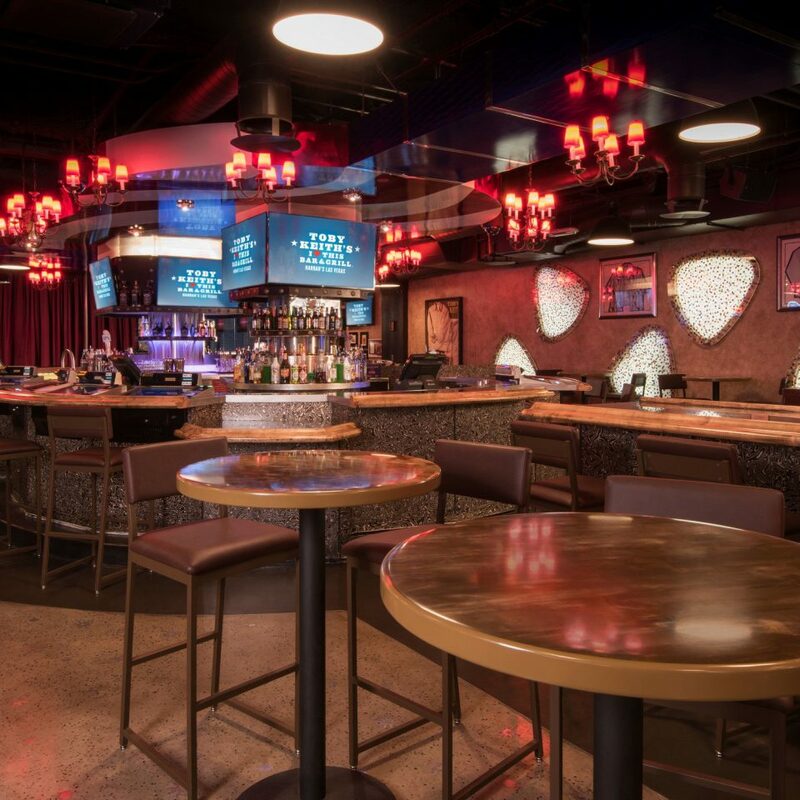 The surrounding Strip holds countless more eateries and drinkeries – we recommend Strip House at sister-hotel Planet Hollywood, another Caesars Entertainment property. The fourth-floor spa is a low-key, peaceful spot, with a steam room, a sauna and whirlpools, plus a menu of relaxing treatments. 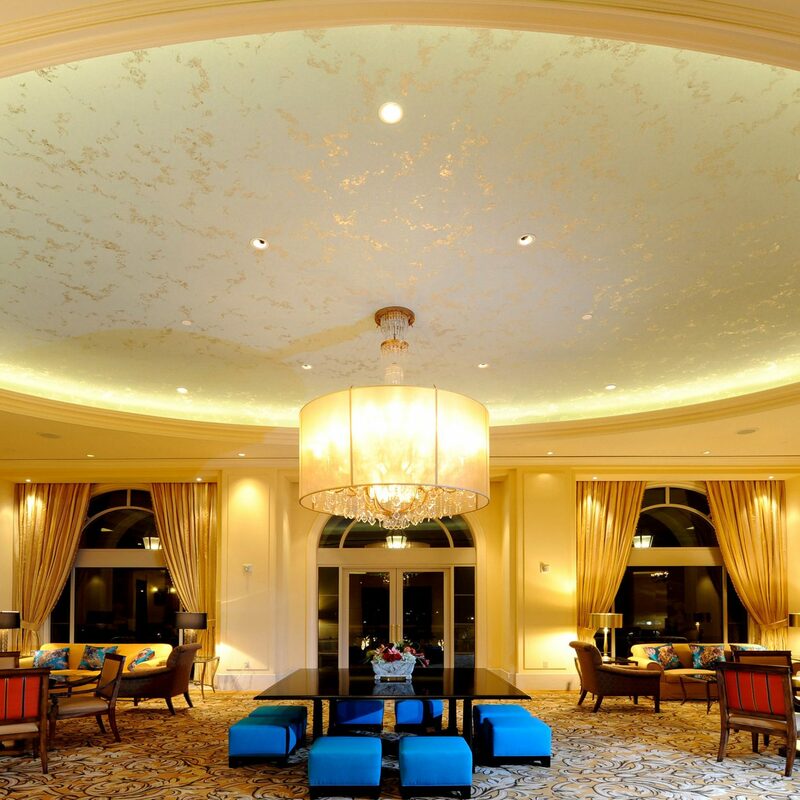 Receive the Warm Desert Stone massage, or wind down with the Stress Reducer package, followed by a service at the salon or a session in the fitness center. Athletic apparel is sold on the premises, in case you happened to forget your workout gear. 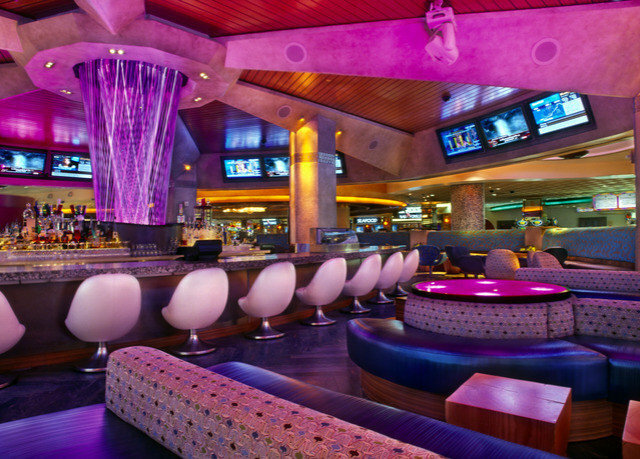 No need to wander far for great entertainment, nightlife, shopping or gambling – all of it’s available here. There are tons of shows, from an Elvis-impersonation review at The Piano Bar on weekday afternoons to concerts by The Righteous Brothers and Tenors of Rock; karaoke occurs five nights a week; DJs and bands perform at Carnaval Court’s open-air street party; shops total 12; and the casino’s got some 80 table games, plus a 24-hour Keno parlor. 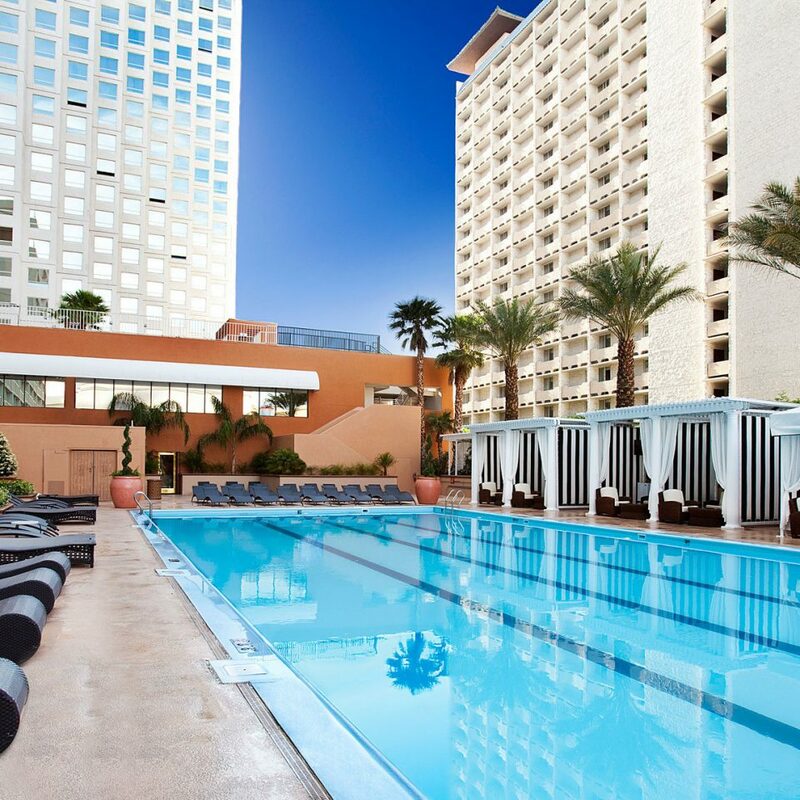 The pool is also a must, when open for the season – this is Vegas, after all.The other best eateries, venues, shops and casinos are steps away, with the High Roller promenade and observation wheel just next door. The hotel shares a monorail stop with The LINQ, to get you up and down the Strip in minutes. 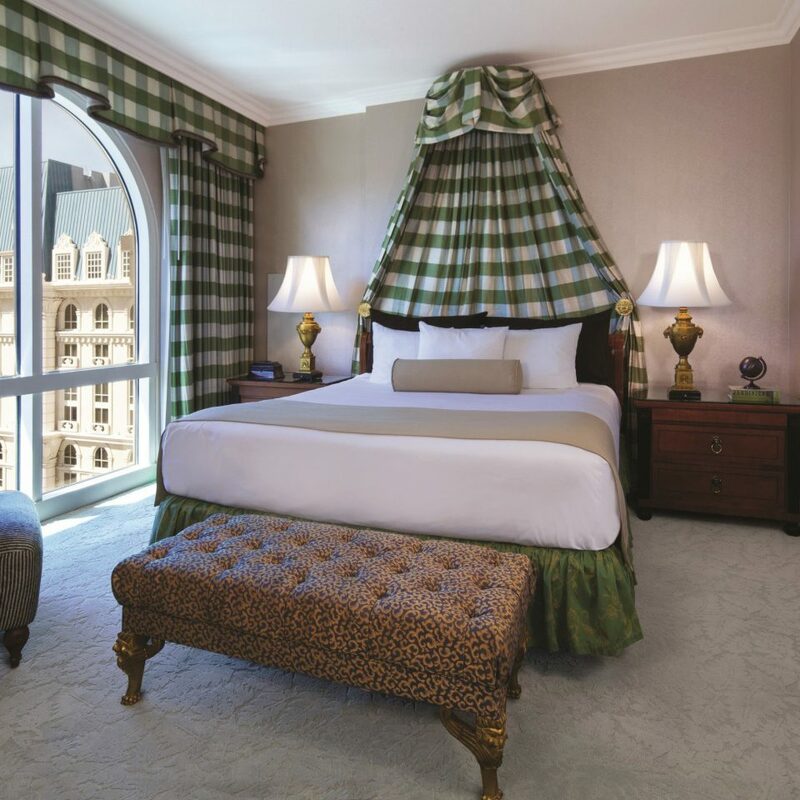 Booked room online and was quoted a different price than what I was charged when I checked out. Talked to a manager and they stated that the extra fees were from a daily resort fee of $39.68. Asked why it did not show up in my confirmation email and they really could not give me a good answer. Ended up paying more than what I paid for the room alone. Very disappointed and upset. 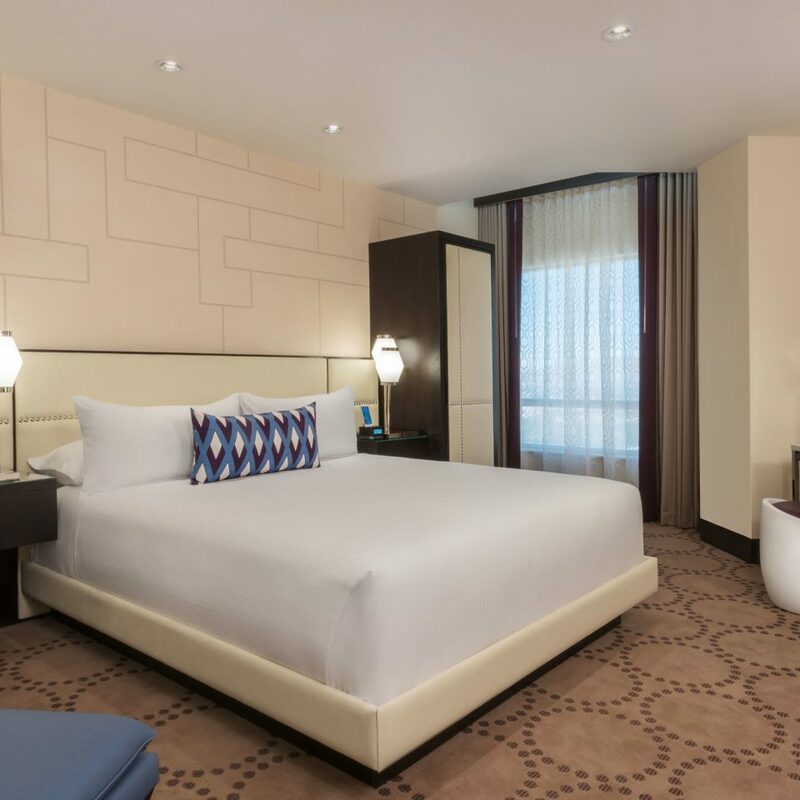 Clean and quiet room, shampoo and body soap dispensers in showers, great water flow in shower, fitness center availability, lots and lots to do in the casino. Buffet was great and most importantly server was most friendly and helpful. Went to Elvis Show- waiting area on top of escalator was very congested. We arrived to the show 30 minutes prior to the opening and we did not get entered into the performing studio until 5 minutes before show time. 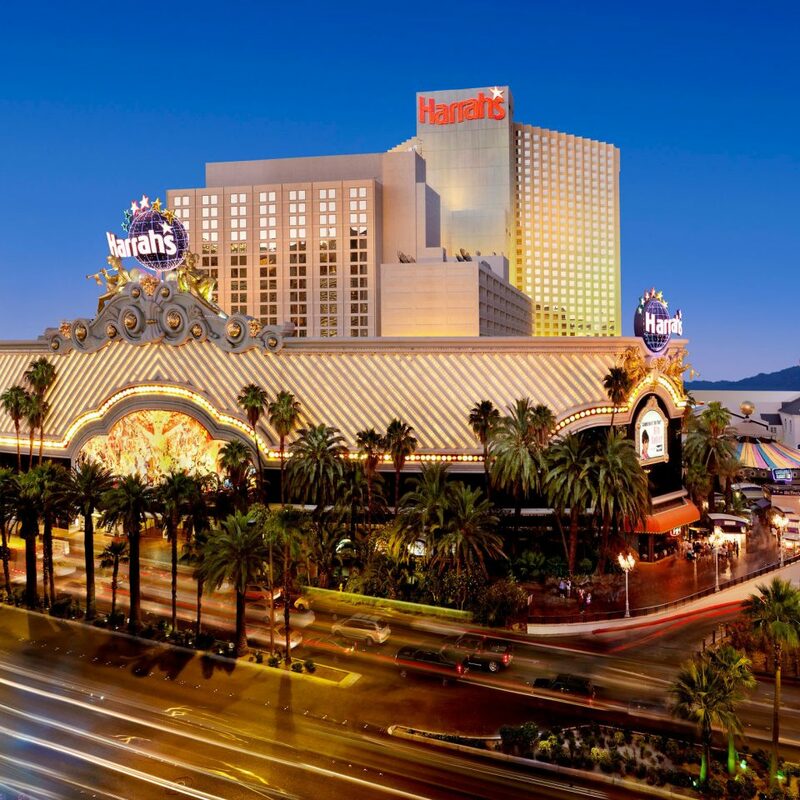 Harrah's was a wonderful choice for our group. While I had never been before, the others in my group had. 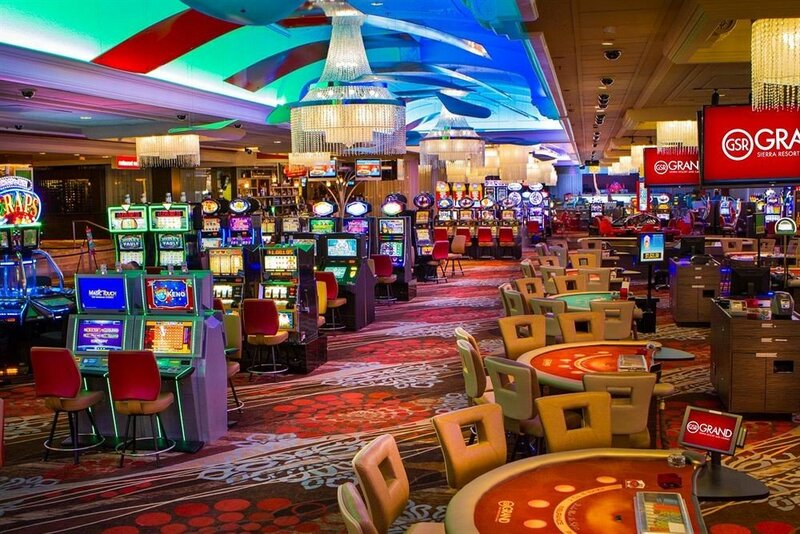 We all enjoyed the central location, rooms, and casino. We received great customer service from Connie at the front desk. She went above and beyond to make sure our large group (that checked in at different times, etc) had a seamless and quick check in. Harrah's Las Vegas is Smashing it! First of all, make sure you play with your players card no matter which hotel/casino you are in. You earn valuable points that can help pay for food, hotel stays, etc. The casino was putting on a little makeup while we were there lol (repainting some trim in the casino). Flavors Buffet is awesome. We had it for breakfast. I think it was around $21.00 per person. You cannot imagine all the food choices! And everything was at the temperature it should be, everything was fresher than fresh.